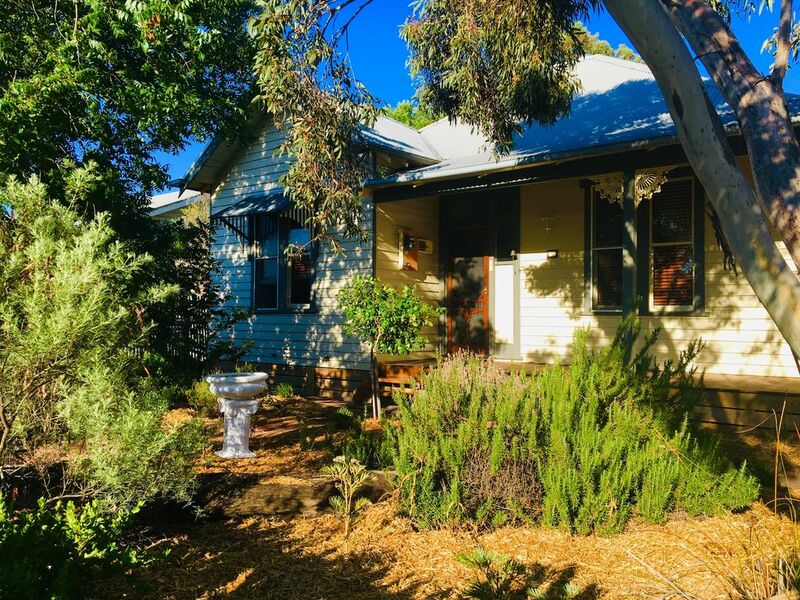 Tanderra Cottage captures the charm & character of days gone by, without missing out on your modern day comforts. 2 x King Single beds in the 3rd & 1 x King Single in the 4th. The main Bathroom includes separate Bath & Shower,Laundry with Washing Machine & Dryer. Fully equiped country kitchen with seperate dining & Lounge. Step outside through the French doors into the huge covered entertaining area with BBQ. Continue to stroll down the brick pathway through the garden to the rear of the yard to the Cubby house & Sandpit. Tanderra Cottage is conveniently located 1km from the CBD, Shops, Restaurants, Galleries, Cafe's & Racecourse. Visit the local Wineries, take a walk along the Wimmera River, A short drive of 34km will take you to nearby Mt Arapalies, famous for its Rock Climbing, Bush walking & Hiking. Take a day trip to the Grampians, or surrounding areas such as Dimboola, Stawell & Great Western. Owners Craig & Danielle live & work in Melbourne. This property is used as both as a holiday home for the owners & also a short term rental property. This property is full of old world charm with all of your modern creature comforts including Free Wifi and Netflix. Located in a quite street, with a large tree filled back yard. Great for your business, couples and families. We are pet friendly, so your pets are also very welcome. We have a fully fenced and secure back yard for them to explore. Pets are allowed inside, but we do ask that you do not allow them up onto any bedding or furniture. You are also responsible for cleaning up after your pets during your stay. This 100 year old home is full of character & charm, yet has all of your modern day creature comforts. This home is the owners home away from home & as guests we hope you enjoy the home as much as we do. If you are looking for all the comforts of home, this property is definitely for you. Another great stay. A well presented, clean and tidy cottage with a touch of luxury. We will be back. We had a great time at Tanderra cottage. You name it, they had it at Tanderra. Best equipped pantry ever seen at a short term holiday rental. It was a home away from home for us. We would definitely recommend this home for anyone wanting to just move in and just kick back and relax. Thank you for a comfortable and enjoyable stay. The house is well equipped for a family holiday and close to local attractions. We had a great time. Property had everything we needed and more - appreciated the Netflix and wifi . Central handy location . Will stay again for sure. The cottage was perfectly located between The Grampians and Arapiles, so it was easy to access both sites, which is what we needed. The cottage was super clean, very cosy and pretty and had lots of personal touches with the best bath oil, scented candles, teas and coffee, beautiful bedding and the most comfortable beds. And the best thing for us was that we could bring the dogs. They were very welcome there and had a beautiful garden to play in. Thank you Danielle for a very relaxing holiday! So pleased to hear that your family including your dogs had a wonderful stay & enjoyed all of the facilities so much. Clean, tidy and very comfortable. As adorable inside as it is outside. The rear spacious garden would be well utilised in summer. Perfect for our girls weekend away.